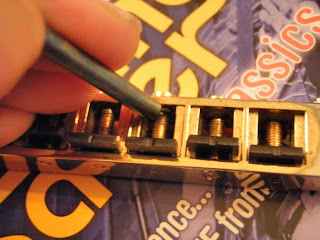 Removing and replacing the saddles on a Tune-O-Matic (TOM) bridge can be a confusing and somewhat fiddly process, but really isn’t that difficult. 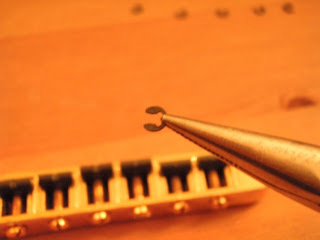 Note, though, that there have been several variations of the TOM bridge, and the process differs slightly from model to model. Also important to note is that each different bridge requires a different set of Graph Tech saddles, so make sure you buy the right ones. Here’s the patient. 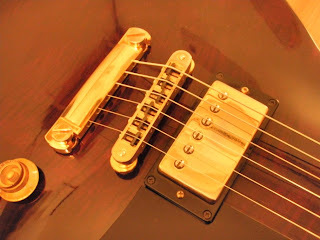 It’s a 1993 Gibson Les Paul Studio. If you look closely, you can see that the strings have started to make their own slots where they shouldn’t, though that's not the only reason for this upgrade. 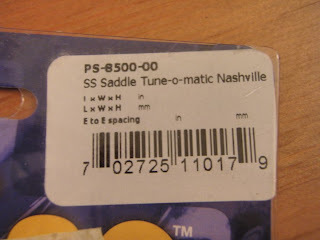 The bridge in question is a Nashville pre-2000 bridge, which means the required Graph Tech saddles are part number PS-8500-00. Once the strings are removed, the bridge lifts off very easily. In fact, be careful it doesn’t fall off when you aren’t paying attention (same goes for the tailpiece, which slides off back the way). Here’s the bridge, with the old saddles still in place. 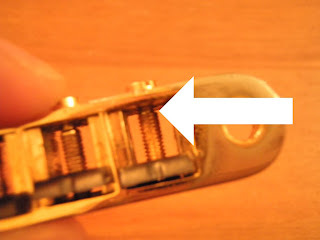 It is important to understand that TOM saddles (or rather, their screws) are held in place with some sort of retainer, be it a spring, wire, clip, or whatever. 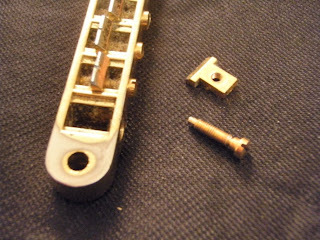 Luckily, this particular model allows the saddles (and their retainers) to be removed very easily. First, unscrew the screw holding the saddle in place. As the saddle hits the front of the bridge, you will feel some resistance, but if you (carefully) continue to unscrew, the screw will force its way past the retainer and start to exit the back of the bridge. Looking under the bridge now, you will most likely still see the retainer sitting in place. If you don’t see it, then it’s time to look around as it probably fell on the floor or workbench. 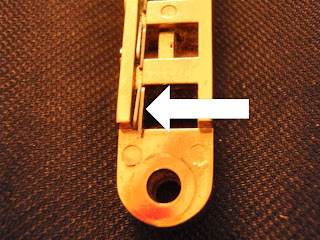 The retainer can easily be lifted out with a screwdriver or similar. Repeat this process for all six saddles. It’s a good time to give the bridge a good clean at this stage, as it’s unlikely to be as easy to do so anytime soon. Here’s the set of Graph Tech saddles. 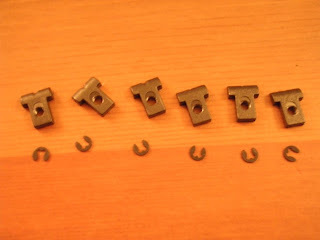 The saddles also come with six retaining clips (small E Type circlips). 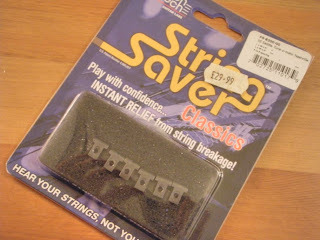 Make sure you don’t miss these as they are hidden behind the sponge in the packaging. 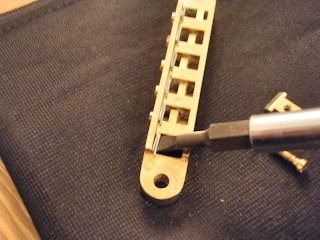 The saddles are placed in the bridge as follows, and the screws screwed in without the clips. 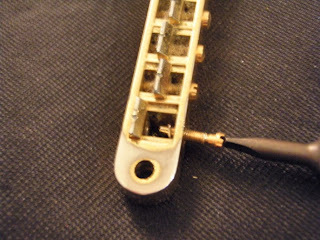 Note that three of the saddles have wide slots (for the wound strings) and three have narrow slots (for the unwound strings). Make sure you put these in the right positions. 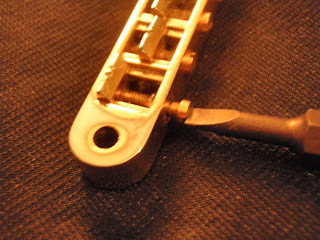 Now for the fiddly bit, the clips have to be pushed onto the small grooves in the screws. The location of the grooves is pointed out below. A fairly simple way to do this is to place them more or less in place with pliers and then push down quite hard with a blunt instrument – in my case, a blunt punch. You will feel a definite click into place when they move to the correct position. Again repeat this process for all six clips. Here's the bridge with all six saddles and clips in place. The position of the saddles is a bit of a guess at this moment. The bridge is now put back on the guitar and intonated accordingly (that lesson’s for another day). Any idea on the size of those E clips? I lost and ruined a few. Sorry Dan, I've no idea. I don't even have the guitar in my possession to check this. Let me do some research and see if I can find out. Otherwise, I'd advise you to use a Vernier caliper to measure the diameter of the little collar on the saddle screw that the E clips clip over. That's the measurement that matters here. I checked my circlips at my Bridge. The size are 2mm or 0.0787. There are also used for RC Cars. I bought bought them in a german store named Conrad. Hey, I see that you didn't put retainers back on the screws after you installed Graphtech saddles. So is the E-type washers the only thing that holds the saddle screw in place? 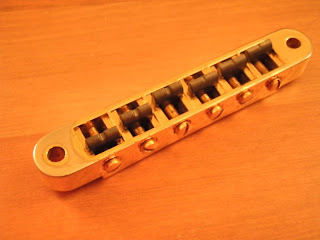 If so, I was wondering if I could use them instead of little hex nuts which are atm on my Jackson T-O-M equipped guitar. Yes, correct, I'm using them instead of the original retaining springs and they are the only thing keeping the screws in place. The old retaining springs would work just as well. 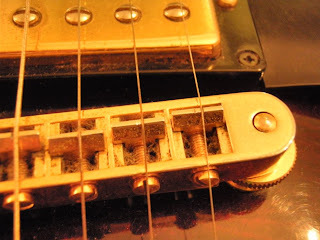 As for the hex nuts on your Jackson, I'd really need to see some images, or at least a link to the exact bridge you're using. So I'm an idiot and didn't even realize those little C-clips(E?) 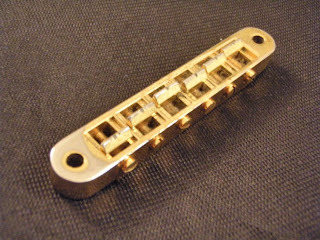 were in there, holding the screws in the bridge of my Washburn J9. So when I went to remove one, instead of just pushing out when unscrewed all the way, the head popped off. Any idea where I could find another screw to replace it? 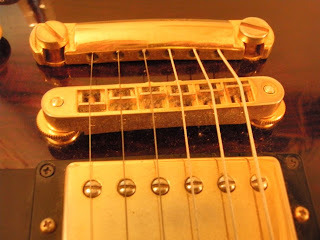 The bridge on this guitar seems to be a bit of an anomaly - looks like a regular Tune-O-Matic with a Bigsby tailpiece, but the specs are different than any I've come across. Sorry for coming so late to the game. I'm a little desperate! Hey Calvin, If the saddles are fairly standard Tune-o-Matic, your local guitar shop might have a bits and pieces drawer that you can look through. Make sure you bring your bridge with you, though, as there are a few variations that look the same, but are slightly different specs. Another workaround, depending on how much of the screw you still have, might be to cut a slot in the end where the head used to be and use a small flathead screwdriver to adjust it (so it would end up looking more like a grub screw). Again, it would depend on how much of it is still intact. 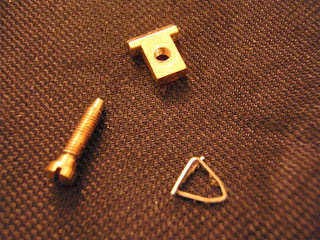 The saddle adjustment screws on my Tonepro Nashville style TOM bridge have a phillips head and then hex nuts at the other end. 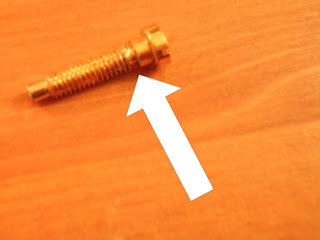 I've read that on bridges that have these types of saddle adjustment screws, the saddles can not be replaced because if the hex nut is removed on the adjustment screw, it cannot be re-attached. So, if you remove the screw, the bridge is then ruined. I purchased a set of Graph Tech string saver saddles, as well as replacement adjustment screws without the hex nut before I started researching this and realized there was a potential issue. Can I, in fact, replace the saddles using the replacement adjustment screws that do not have the hex nut? Russ, I'm sorry, I just don't know the answer to that one. 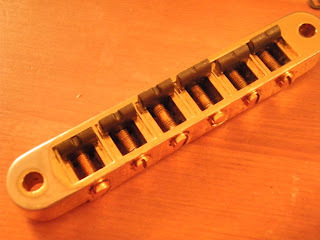 I wonder if it might be worth asking Tonepros (http://www.tonepros.com/contact-us/)?